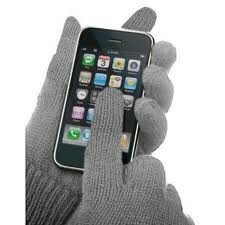 Buy some texting gloves for use with a smartphone or other touch-screen device so you enjoy technology without freezing your fingers off! Touch screens have become increasingly ubiquitous in our technlogy-driven culture, and soon enough they'll be found in every device imaginable. But when winter hits, they become nearly useless, or we have to deal with frozen fingers whenever we want to send a text or answer a phone call. Luckily texting gloves are readily available, not any more expensive than ordinary gloves, and popular enough to come in all sorts of styles to suit all sorts of fashionable fanaticism. How do texting gloves work? Smartphones and other touch screen devices can sense user input in a number of ways, though one commonly used method (the one found in the iPhone and similar devices) is to detect electrical currents. Whenever the user touches the screen with a finger, a little bit of electrical charge is transferred from the phone to the user. The phone registers where this contact occurred, and processes it as a tap. Yes, your phone electrocutes you all day long. Texting gloves exploit this by simply placing conductive material, like particles of metal, into the fabric of the gloves. Instead of the current having a hard time moving around, like it does with fabric, the conductive particles offer it an easy avenue through which it can jump into your fingers. Because many of the gloves have these conductive portions only on the fingertips, where they're most useful and the material is cheap anyway, texting gloves can be dirt cheap, and there's no reason not to get them over ordinary gloves. So let's do some shopping! So "unisex" will remain in the eye of the beholder, but these gloves are about as gender-neutral as one can find. 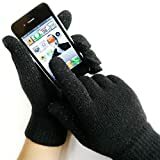 Most inexpensive texting gloves consist of the knit variety, the kind that stretch to fit most hands, and can fit on either side. There's quite a selection out there, from acrylic fabric to wool, and gloves featuring just a few touch-sensitive fingertips, and some that can be used with all 10 fingers. Some of them advertise the fact that they work with touch screens, and others try to be as subtle as possible, and look just like regular gloves. Shop around and take your pick and just remember to pick the right size, as many of these come in multiple sizes for different people. For tougher gloves, check out some of the options listed further below. Knit gloves tend to be cheap, but might not last as long as you might like. People who live in colder climates or will otherwise make more use of the gloves should probably pick out something a little tougher. There's a saying in some sectors of the clothing industry when a product has been made to fit male bodies, and the manufacturer wants to expand into the female market as well. "Pink it and shrink it." Socks and gloves tend to fall into this category quite frequently. That said, there are plenty of options for the ladies out there, from simple knit pink gloves, to more elaborate creations that hopefully will be as fashionable as they are functional. For a step up from knit gloves, look further below for gloves that will last a lot longer, a must for anyone living in colder climates, or who might use them much more frequently, and want them not to fall apart quickly. Click for more options from Amazon! While the above choices might be readily available and inexpensive, some people might want to invest in some tougher gloves that will hold up for quite a few seasons, instead of cheaper options that will inevitably unravel into a ball of yarn. Tougher gloves can be found by the likes of Isotoner, as well as some of the larger brands such as North Face and Timberland. These will probably last for many years, and will be a lot warmer and more weather-resistant than the knit gloves, which tend to get soaked pretty quickly in the rain, and ripped apart when scratched against something. These gloves will be more expensive, but you'll probably have them far longer than the knit gloves above, and if that's what you're planning on doing, these are the way to go. You'll probably save money by buying just one pair, instead of a new set of knit gloves every year or two. In this article, you'll find step-by-step instructions on how to download and install an app from the Android Market to your smartphone via your PC.